What’s this? Wonder Wednesday?! It’s been MONTHS since I did that! Yeah, well, it’s been an insane year, and I had to cut way back on pretty much everything. But I didn’t want to let the year go by with at least one more installment, and when better than just in time for a Christmas story with everyone’s favorite pagan superheroine! I only wish I had a better one to give you, but I hear it’s the thought that counts. DC Universe DCU Holiday Bash! III, DC Comics, January 1999. Well, that’s certainly a convoluted title, isn’t it? But the 1990s were a convoluted time for comics. 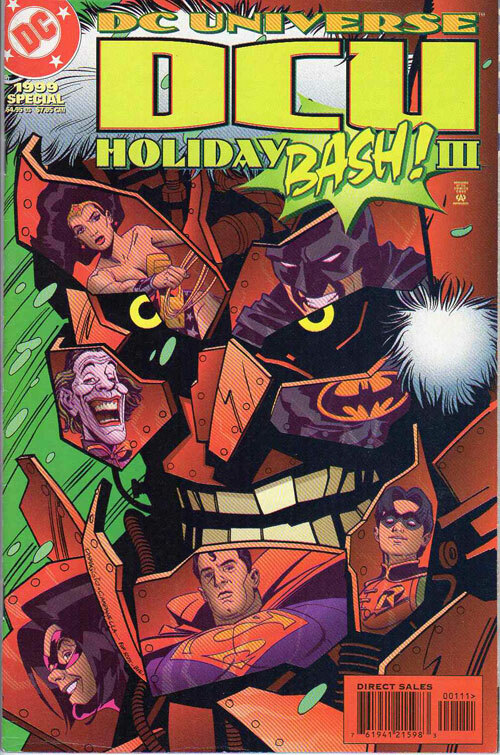 DC was doing these holiday specials every year for a while—twice a year, actually, including the Halloween ones. 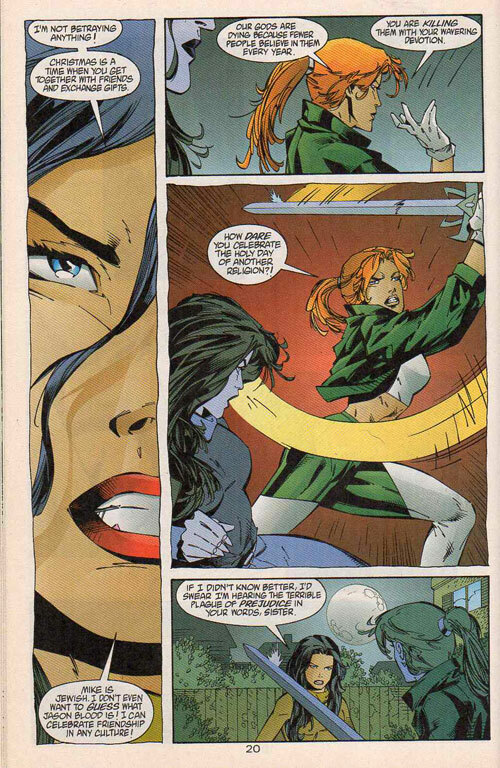 The one for 1998 was unusual in that it included a Wonder Woman story. And, you know, I get it. These holiday specials were really Christmas specials with an occasional Hanukkah or Kwanzaa story thrown in to keep things diverse, and there’s nothing that says Christmas less than a hero steeped in Greek mythology—except Christmas with Thor, I guess. Besides the WW one, this issue included a Superman/Batman story, a two-page Joker feature, a Robin story, a tale about the supervillains incarcerated at the super-prison the Slab, a story with Western hero Bat Lash and one about the incorrigible young super-speedster Impulse. And really, none of them are very good. Mark Waid and Devin Grayson’s story about Impulse filling in for Santa Claus is kind of cute, and Scott Beatty’s villain story is vaguely touching, but all in all this isn’t one of DC’s better holiday specials. But of course what we’re here for is the Wonder Woman story, aptly titled “Heathen Ways.” The writer is Eric Luke, who was just starting his one-and-a-half-year run on Wonder Woman. You might say, Eric Who? Well, he did a little bit of screenwriting—most notably the 1985 River Phoenix flick Explorers—and in comics he also wrote the first series of Ghost, a popular cheesecakey superhero at Dark Horse Comics. That’s pretty much it. He’s basically the guy who was writing Wonder Woman in between the much better known runs of John Byrne and Phil Jimenez. The artist for this story is Cedric Nocon, best known for drawing Supreme for a couple years in the mid-’90s, before Alan Moore came along and somehow made Rob Liefeld’s testosterone-crazed Superman knockoff cool for the first time ever. But enough foreplay. How’s the story? Well, it’s not great. Diana goes to visit some friends of hers at Christmas, and they make a lot of small talk about the current status quo in her own comic. Among the friends she’s visiting are not only Jason Blood, host of the Demon Etrigan (unrecognizable with his inexplicably black hair instead of the usual red), but also Cassie Sandsmark, the little girl who’s going to grow up to be Wonder Girl. Nothing terribly interesting happens with them, but I thought it was at least worth mentioning. Sulking outside is Artemis, the ornery redheaded Amazon, who refuses to participate in Christmas out of loyalty to the much-neglected Greek gods. So Diana has to go out there and give Artemis a little Christmas spirit. And how does she teach Artemis what Christmas is all about? By beating the crap out of her, naturally. 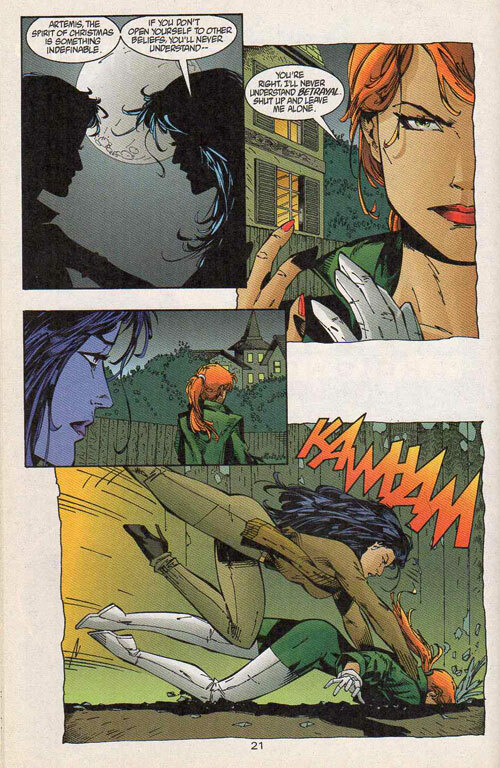 Which, of course, is just about the nicest gift she could have given Artemis. And that’s pretty much the whole story. I did mention it wasn’t very good. But it’s certainly very ’90s. Here’s hoping your holidays are much better than this, and not ’90s at all unless that’s what you’re into.